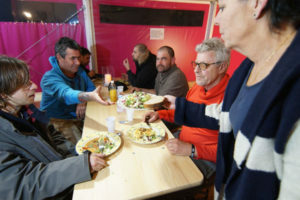 Last month, our Swiss member Sozialwerke Pfarrer Sieber (member of Diakonie.ch) concluded its seasonal project to provide homeless people and migrants with an emergency shelter. A dramatic increase in the number of stays was recorded for both services, delivered in the Zurich region. Over the past five months, the emergency social service office of Pfarrer Sieber has recorded 5,517 overnight stays for about 294 homeless people. Despite the relatively mild winter in Switzerland, Sozialwerke Pfarrer Sieber recorded about 1,414 new stays compared to the previous year. The emergency shelter for migrants has also recorded an unprecedented number of 2,684 overnight stays, with a dramatic increase of 1,601 stays. Also, the average period of stay increased from 15 to 19 nights. According to a survey of users conducted by our member, the main reasons for the significant increase in overnight stays can be found in the the shut down of three shelters for homeless people in Zurich. The emergency shelters were also aimed at supporting people who are experiencing loneliness, creating a conflict-free atmosphere. To know more about this project, please read Sozialwerke Pfarrer Sieber news.